In a small saucepan combine garlic, turkey stock, thyme, and rosemary; bring to boil, cover and simmer 20 minutes or until garlic is tender. Purée garlic mixture with parsley, lemon juice and olive oil in a blender. Remove neck, giblets and excess fat from turkey. Lift skin at tip of breast, carefully slide fingers between flesh and skin on both sides of breast up to the neck and over legs and thighs creating a pocket. Spread herb mixture in the pockets formed between meat and skin. Pat cavity dry and place onions in cavity. Rub any extra herb mixture on the outside skin or in the cavity. 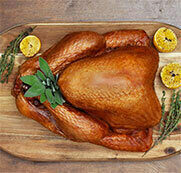 Place turkey on a rack in a shallow roasting pan; tuck wings under the body and tie the legs together. Cover with a loose tent of foil and roast at 325°F (160°C) until a meat thermometer inserted in inner thigh reaches 170°F (77°C) or when juices run clear when thigh is pricked with a skewer. Remove turkey, draining juices into the pan and let rest 20 minutes before carving. Place roasting pan over low heat, stir and scrape the pan to loosen brown particles. Pour juices into a bowl; let fat rise to the top and skim off fat. For every 1 cup (250 mL) of degreased juices (if more liquid is required, add degreased turkey stock) add 1/2 cup (125 mL) orange juice or white wine blended with 1 ½ tbsp (22 mL) corn starch. Bring to boil, stirring constantly until thickened. 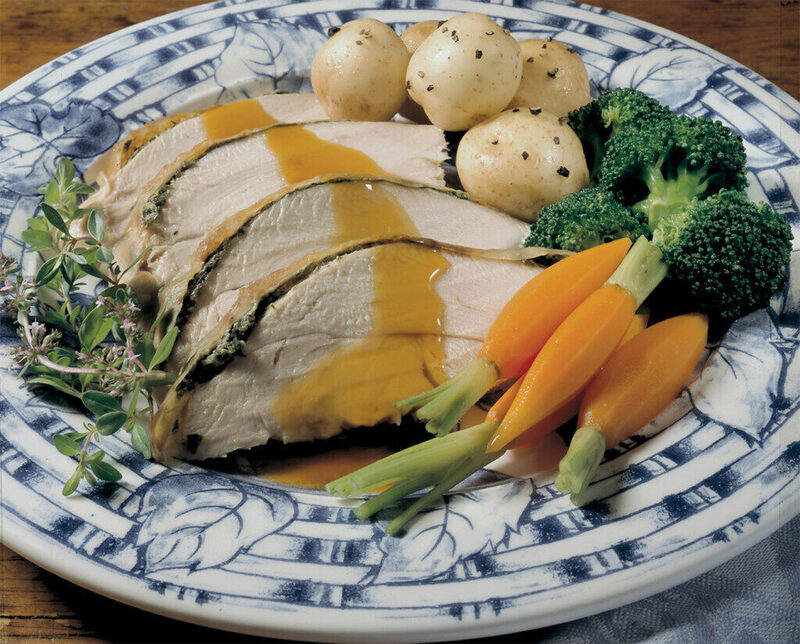 Serve on the side or spoon over sliced turkey.